The previous visibility-periods (from Trilobites and Ammonites) were ‘closed’. They did not pose problems of a beginning and end (if particular difficulties with regards to the establishment of boundaries, and the definitions of the participants are left untouched). There is no element of prediction, because their life span is known. It is only a matter of comparing their occurrences in time with the general characteristics of the CF-graph in terms of intensio and remisso to describe their characteristics. The Trilobites and Ammonites are only two of the many extinct animals in the geological record to which the quadralectic method can be applied. Their disposition as index fossils is a major advantage, but other groups of extinct animals can be treated in the same way. The next step will lead to the study of all Large Animals on the planet Earth, dead or alive. Large Visible Animals (LVA) are defined as all the living bodies in nature, which are part of the animal kingdom and can be observed by a human being without the help of artificial equipment to enhance visibility. This definition reflects a straightforward approach to nature from the human point of view. It means that certain primitive cells, which have been found in very old rocks (fig. 74) do not qualify, although they play an important role in the definition of life on earth-in-general. Fig. 74 – These curled fossils are the first signs of life as found in the geological record. They were dated as 2.15 billion years old. These eukaryotic (multicellular) organisms are known as Grypania spiralis. The photosynthetic algae were discovered in the 1980’s and caused a stir because they were over one billion years older than the next closest in age eukaryote. The beginning of the ‘large’ animals is clear as long as the finer details are left alone. The Large Visible Animals (LVA) occur in rocks, which are not older than around 600 million years old. The figure of 590 mya has been used in publications, based on Rubidium-Strontium ages. Recent research, coordinated by the International Subcommision on Cambrian Stratigraphy (I.U.G.S. ), put the boundary at a considerably younger age, i.e. 545 mya. The coarse boundary between the so-called Cambrian rocks – named after an area in Great Britain (Wales) where these rocks surface on a large scale – and the underlying Proterozoic rocks was primary chosen on the grounds of the occurrence of ‘larger animals’. Nevertheless, a precise boundary, which is useful on a worldwide scale, is much more difficult to give. The study of early shelly macrofossils (SSF; small shelly fossils) did not provide enough correlation potential. The so-called trace-fossils (imprints of animals, but not the animal itself, like burrows) offered a better opportunity and the ichnofossil Tricophycus pedum was subsequently chosen by the specialists to indicate the lower Cambrian boundary. The rock section (Chapel Island Formation) at Fortune Head, southeastern Newfoundland, became the type section of the Protozoic-Cambrian boundary. Researchers (GEHLING, et al, 2001) found that the range of Treptichnus pedum – an index trace fossil for theTreptichnus pedum Zone – extends some 4 meters below the Global Standard Stratotype-section and point for the base of the Cambrian Periodat this location. The results prove the ambivalence of the ‘accuracy’ of a particular geological boundary. This scientific bickering does not mean that such a boundary cannot be of practical use in the field. 1. The Vendian period (565 – 543 mya) former to the ‘Cambrian explosion’ with the sudden emergence of the metazoa with soft body, including the so-called Ediacara fauna. 2. The S.S.F. appearance (Small Shelly Fossils) characterized by many small organisms with shells, spicules and a low diversity (543 – 530 mya). 3. The Tommotian-Atdabanian radiations (530 – 525 mya) with the emergence of most modern lines and many extinct specimen (with hard skeleton and soft body). The first macroscopic faunas occur at the end of the Siberian Tommotian Stage, when major reefal complexes were formed by Archaeocyaths (simple sponges). 4. The Burgess Shale fauna (towards 520 mya). This Middle Cambrian shale from the Burgess Pass, Yoho National Park, British Columbia, was discovered by Charles Walcott in 1909 and yielded strange and previously unknown animals with no modern analogues. The extremely rapid diversification of multicellular animals is unique in the geological history. The sudden event provides a good point of recognition (POR) on the CF-graph of the communication between the Large Visible Animals (LVA) and the world. 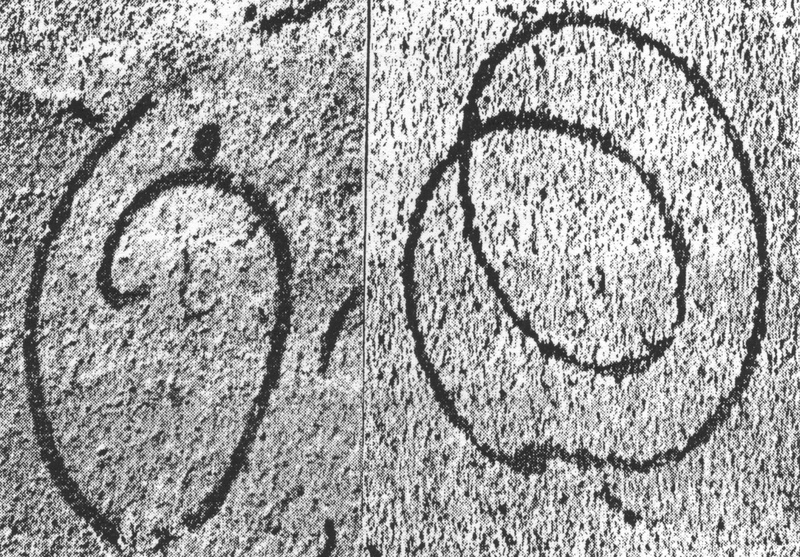 The start of the visible visibility of the LVA’s is put at the beginning of the Tommotian, i.e. 530 mya. 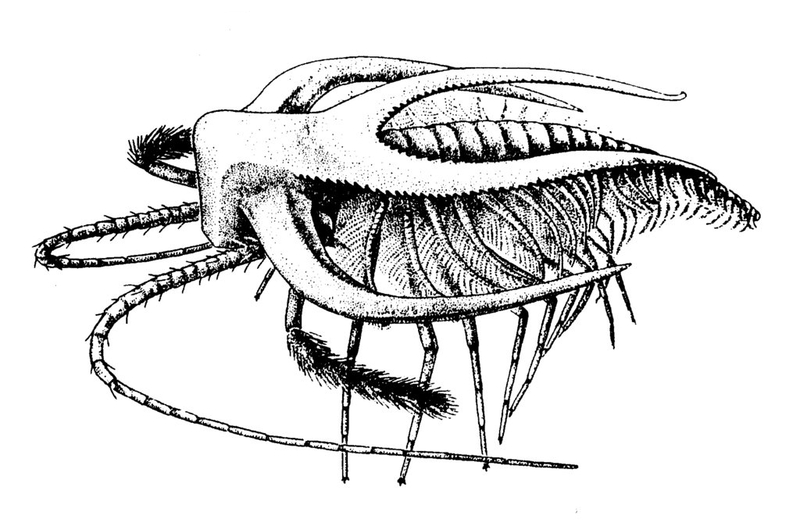 The Large Visible Animals (LVA) figure in the history of the world from their starting point in the Early Cambrian (- 530 mya) to the final (or last) visibility far away in the future, some 7610 million years from now (fig. 75). The abbreviations of the inflection points on the (visible) visibility area X of the CF-graph are given on p. 122, fig. 51. Fig. 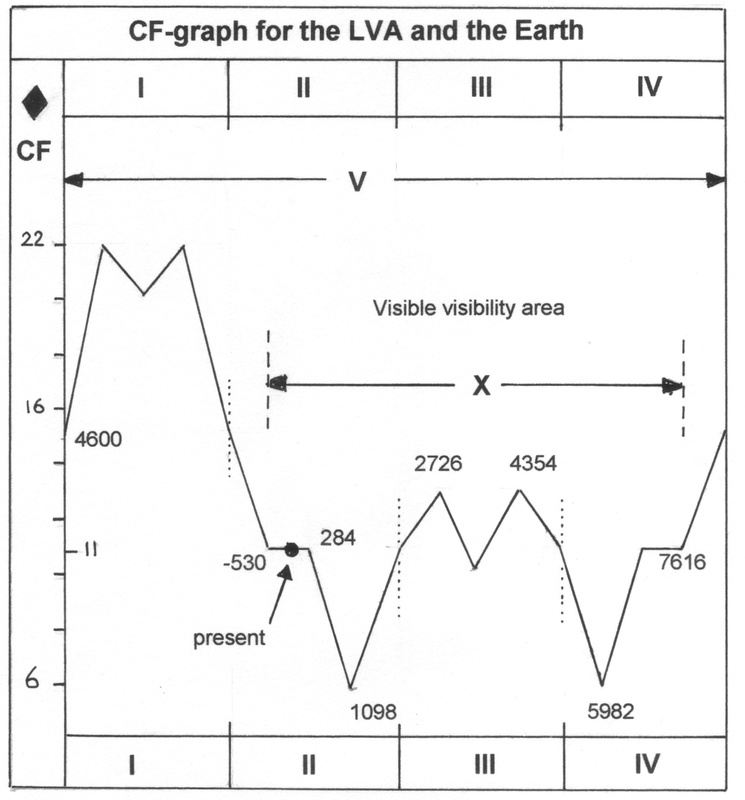 75 – The communication between the Large Visible Animals (LVA) and the planet Earth as expressed in a CF-graph. The present, or ‘here and now’ as experienced by the observer, is situated in the second part of the Second Quadrant (II, 2). This position falls relative early in the development of the visibility, i.e. between the First Visibility (FV) and the Approach Point (AP), when the CF-values remain a steady 11. All the geological epochs so far, with their huge changes in climate, the ongoing process of continental drift, the appearance of new species and the extinction of others, are – in the perspective of the LVA’s – a minor opening act to the great developments, which are about to come. The stage of equality (CF = 11) will last another 284 million years. Most likely, the geological epochs will continue to happen in their own way. New species will turn up. There is plenty of time and opportunity for the development of a new stock of huge reptiles (like the Dinosaurs). The present-day Nautiloides might give rise to a renovated breed of curled and chambered see animals (like the Ammonoids). Other groups (including mankind) will most likely disappear. However, it is more than likely that other clever vertebrates (or some unknown animal with other building materials) will take their place. The fate of Homo sapiens will be looked at in the next chapter. The First Major Approach (FMA), with the CF-value 6, will take place some 1100 million years in the future (which is more than the geological history of the LVA’s to date). The full potential of the Large Visible Animals within the realm of the planet Earth is reached at that particular time. It will be hard to imagine how such an animal kingdom will look like at that given time. Also the further development – including the major ‘crisis’ in 2726 (FVC) and 4354 (SVC) million years time – go beyond the frame of reference of the present day observer. The only certain thing to say – with the universal communication (CF) graph at hand – is that the large visible animals will disappear from the earth after 7610 million years. Another basic unit (BU) further on the CF-graph – i.e. 814 million years – spells the end of (large) life altogether. The earth is in 8424 million years time as barren, as it was when the formation of the solid earth by accretion took place some 4600 million years ago. In the meantime, the great changes in the position of the continents in the past six hundred million years will most likely continue. The breaking up of a single supercontinent called Rodinia (in the early Cambrian), its merging again (in Pangaea) in the Permian and the subsequent breaking up in Gondwana and Laurasia in the Jurassic and Cretaceous times are only minor disturbances in the light of history. It is fair to assume that these movements will continue in the future. At some stage, the continents will come together again to form a new supercontinent. Life, as it is then, will have to adapt to the boundaries of land and sea. Charles HAPGOOD’s book ‘The Path of the Pole’ (1970) was a controversial, mind-provoking piece of work on this subject. The polar wandering was brought forward as the mechanism that causes the displacement of continents. He pointed to the accumulated centrifugal force, generated by the unsymmetrical ice packs of the poles, which caused enough momentum to displace the crust. Nowadays, this theory is of lesser importance, since the mechanism of ocean floor spreading (for instance from the Mid-Atlantic Ridge) is held responsible for the movement of continents. The cyclic character of the latter fits better in a realistic picture of nature. Hapgood’s suggestion that these continents have a connection with the lost continent of Atlantis does not enhance his popularity with the established sciences. The recent interest in the loss of ozone in the lower stratosphere over Antarctica, as first noticed by a research group from the British Antarctic Survey in the 1970s, has culminated in wild speculations of global warming and the effect of man’s activities on the environment. Even the Nobel Prize was awarded to scientists, who sincerely believed that man made chemicals containing chlorine (CFC’s), could have caused the changes they observed for such a relative short period. The degree of instability of the atmosphere has many causes, both terrestrial as extraterrestrial, and a research period of several decades is not enough to pinpoint a particular source. The measurements of the so-called ‘Ozone Hole’ over a relative short period does not provide the scientific foundation for a postulate of large changes in climate (let alone it possible causes). The concern with the planet Earth is, nevertheless, a good thing and a worthy cause. However, the arguments to ‘better’ the environment should be kept free of unscientific, fashionable or political interference. The end of the ‘Age of Steam’ and the replacement of coal-fired energy sources by oil and gas has done more for the well-being of the people on the earth than the Montreal Protocol in 1987 aiming to reduce the use of CFC’s. On the other hand, the use of fossil fuels (by airplanes and cars) has taken now such an enormous flight that a moment of reflection is appropriate. The consciousness of scale – which was mentioned in the beginning of this book as the best quality to approach life – should never be an excuse to dodge responsibility. The important ‘law’ in quadralectic thinking that the boundaries of a communication are determined by the smallest part (p. 93) implies that the relation between mankind and the earth is ‘ruled’ by our vision as Homo sapiens. Mankind, even in their great number, is the Small Part in the communication with the Earth (as the Large Part). Therefore, our boundaries stipulate the width of the interaction, and our view is the yardstick of measurements. The earth, as a planet, which has been around for some 4600 million years, will help itself. There is no doubt about that. It will survive any onslaught – be it by man or otherwise – and continue its course through the universe. Imagination on a geological scale – with its millions of years – does not shirk us of our obligations. Life in time is a precious thing. It has to be respected, if only for our own good. The curious fossils of the Burgess Shales and the bones of Dinosaurs point to an earth in a different setting, but it will still be our world. And the developments in the future can be no different, whatever happens, even if mankind is gone. The ill-famous ‘Club of Rome’, which shock-waved the world in 1972 with its report ‘Limits to Growth’, has again allayed the message with a new publication called ‘Factor Four: Doubling Wealth, Halving Resource Use’ (VON WEISZÄCKER et al, 2000). This title points, once again, to dualistic tendencies to the problem of resources, which is bound to fail. The real ‘Factor Four’ should be the quadralectic outlook in the conversation with the earth, with understanding as a key word.